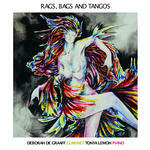 Rags, Bags and Tangos / Deborah de Graaff, clarinet, and Tonya Lemoh, piano. Three short pieces for clarinet : for solo clarinet in B flat / Elena Kats-Chernin. Three short pieces for clarinet : for clarinet in B flat and piano / Elena Kats-Chernin. Naive interlude : for violin and piano / Elena Kats-Chernin. Is a simpler and shorter version than Eliza Aria from the Wild Swans Suite. 7 Mar 2017: at Rags, bags and tangos (Recital Hall West, Sydney Conservatorium of Music). Featuring Deborah de Graaff, Tonya Lemoh. 6 Sep 2009: at Patricia Pollett & Liam Viney (QACI Performance Theatre). Featuring Patricia Pollett, Liam Viney. 28 Jun 2009: at Patricia Pollett (Customs House (Brisbane)). Featuring Patricia Pollett.